How do two blokes from the UK and the Namib Desert relate to each other? 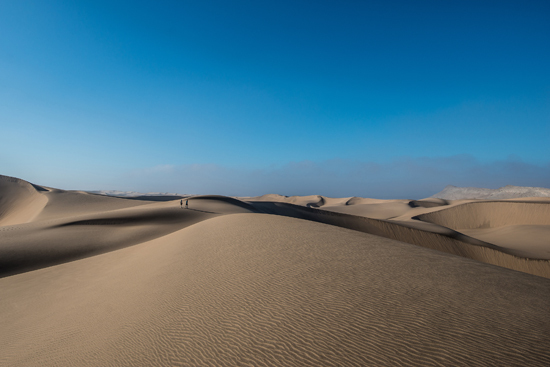 Well, they don’t, but Andrew Murray and Donnie Campbell took it upon themselves to make history and complete an epic nine-day run across the dunes of the Namib recently…. I’ve always wondered why runners run, which is strange as I’m runner myself. I’m not talking about a light evening jog after work with your obese Jack Russell in tow, but the kind of running that scares you a little when you hear about the distance. I mean, why would anyone want to run for nine days straight? Some think that there’s a touch of madness present in the minds of ultra runners. Maybe that madness is what’s needed to complete something grand like these guys did. Three months ago David Scott, the legendary Scottish expedition organizer set the challenge. He sent Murray and Campbell 3 pictures and a short email: “Run Across the Namib desert- some parts have not even been explored properly, here are some photos, sore feet and adventure awaits”. They found the pictures incredible and no convincing was needed. They were going to Namibia and they were going to run their socks off. Andrew Murray (34) is a doctor, runner, speaker and author and Donnie Campbell (30) is a former Royal Marine Commando and personal trainer (as if they needed to be any more impressive). 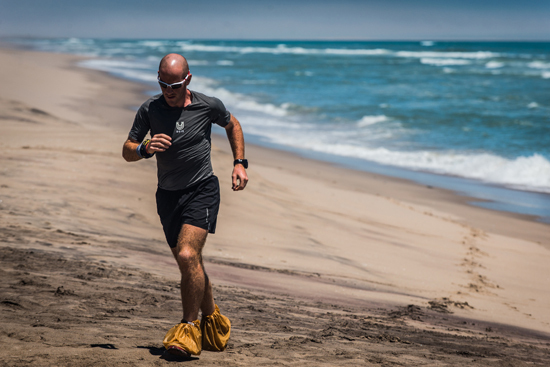 Both of them are seasoned runners; Murray completed a 4295km run from north Scotland to the Sahara Desert and he’s won races at the North Pole, Antarctica and Outer Mongolia. 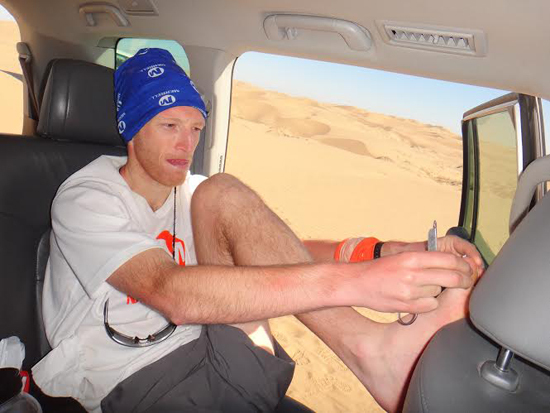 Campbell on the other hand completed a 184-mile (about 296 km) run without sleeping. Needless to say, they knew what they were doing. The challenge was set, they would call it the Namib550. The planning had to start. They secured funding and support from Scottish entrepreneur Bert Jukes of Lyprinol UK. Special permits were required to access the desert. Applications had to be made to tribal chiefs to secure access to parts of the park rich in diamonds that have not been accessed. There was no way to know exactly where they would be running or what the terrain would be like, as parts of their route had never been explored before. The run would be from Lüderitz to Walvis Bay. Live The Journey, a South African based company was brought onboard because they knew the area better than anyone else from receiving assistance from the local Topnaar tribe. The men landed in Namibia and on 2 February the battle began. Setting off directly towards the dunes got the butterflies going in the stomach. Dave had warned us that the desert could kill you in a day if you let it, and the heat even at 8:30 was oppressive. 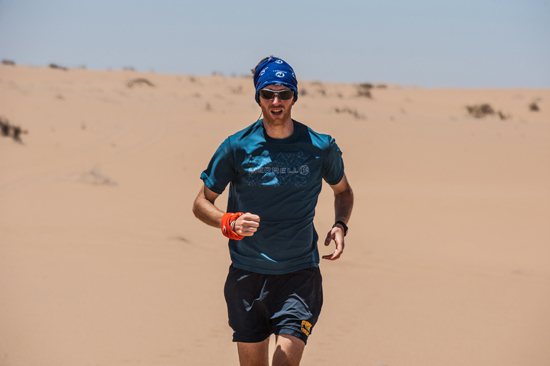 They ran about 60km a day, struggling through thick desert sand, battling over ridges and massive dunes, including the daunting Devil’s Workshop. After day 1, they were exhausted, feet covered in blisters (ok, so maybe they lost more than just their socks) and the task in front of them seemed nearly impossible. An odd 500km had to be covered, that’s all that mattered. Day 3 led them on a straight path through some of the highest dunes in the world. Progress through the desert sand was slow, with their maximum speed averaging at 3kms per hour. What kept them going, however, was their amazing support crew, who was with them every step of the way (whilst towing out their support trucks every few kilometers). They decided to break the challenge down 10km by 10km to keep anxiety at bay about the magnitude of the task ahead. Murray said that there were many times he wanted to give up, but all the sights along the way, such as shipwrecks miles inland, ended up being highlights of the trip. After day 4 they started settling in, getting used to the territory and the elements, finding easier ways to get across the dunes. It was at this point that they thought they could actually make it all the way. Slowly, but surely, through pain and scorching heat they struggled through the following days. 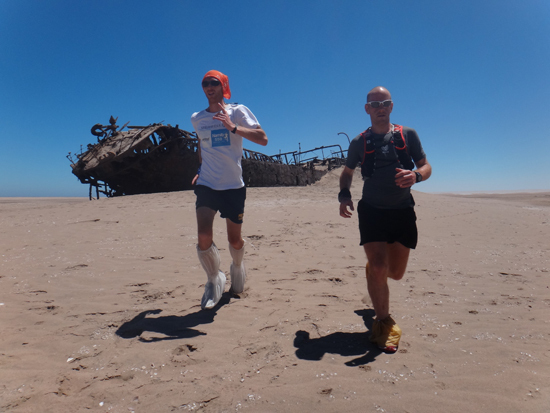 On the last day they were 55km out from Walvis Bay and they finally knew the terrain would be good to them, so at that stage it was merely a formality getting to the end. 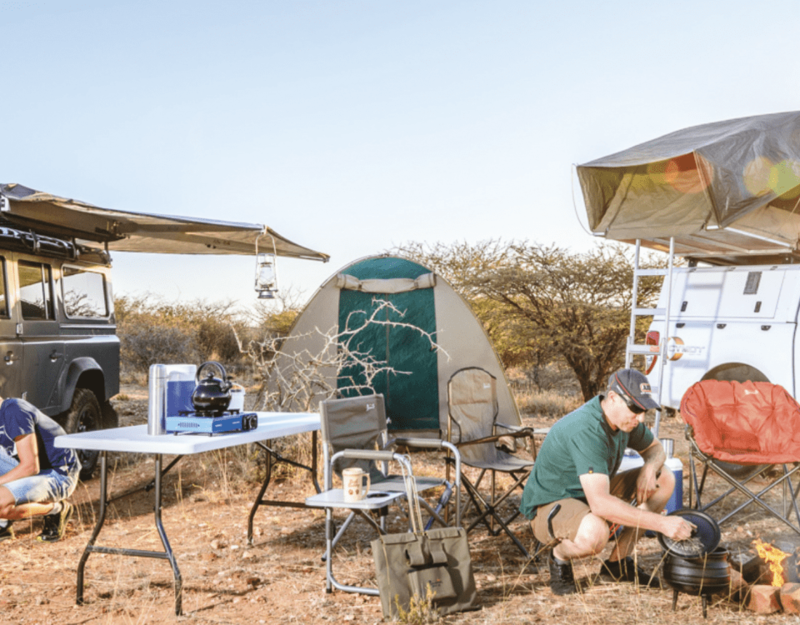 They had seen the splendor of the desert, it’s intimidating dunes, the incredibly adapted wildlife such as the Gemsbok and even some of the not-so-great creepy crawlies. What they hadn’t seen on their journey was people. 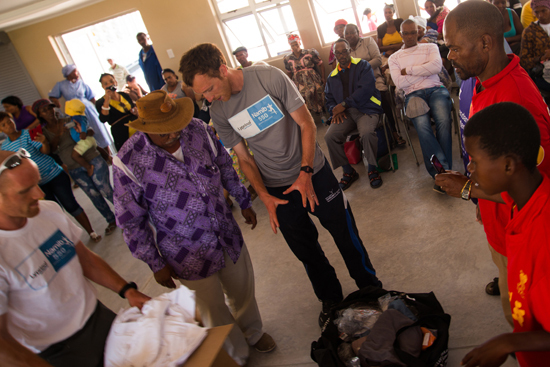 Upon their arrival in Walvis Bay the Topnaar community welcomed the two men back into civilization. Any finish line is great, but one with a pint of beer and the promise of a shower is even better, said Campbell. Murray responded, Donnie deserved more beer than me. He had put up with my whining about my back and various ailments and stayed strong throughout. When a newspaper asked him if he had thought of giving up he simply said “I was in the marines, so no”. So they did it. 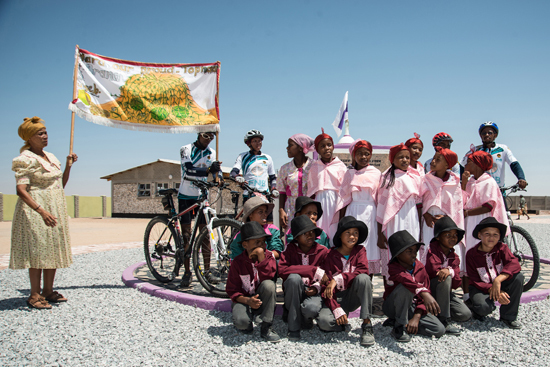 They completed a total distance of 504km across the Namib Desert: something that had never been done before. Having covered the distance in 9 days instead of the initially planned 10, they had an extra day for community work. Medical supplies were distributed to locals and health workers. 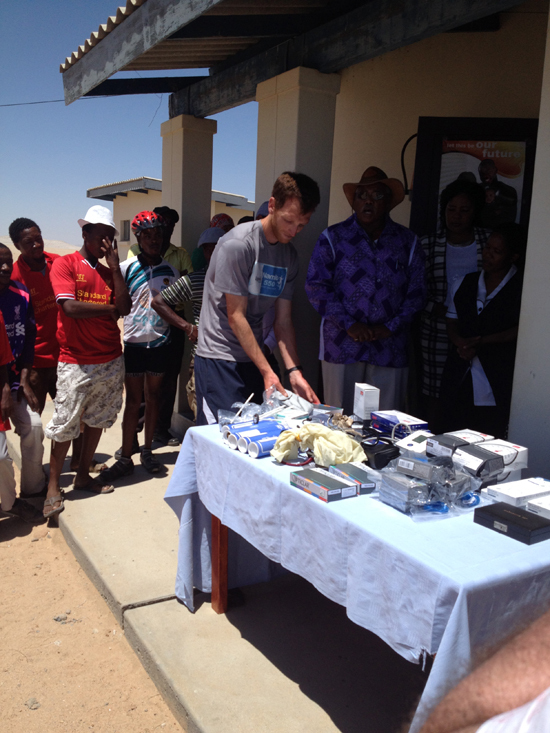 The vital medical equipment was donated by GPs and hospitals via the Royal College of Physicians and Surgeons of Glasgow to supply four clinics around the Walvis Bay area.